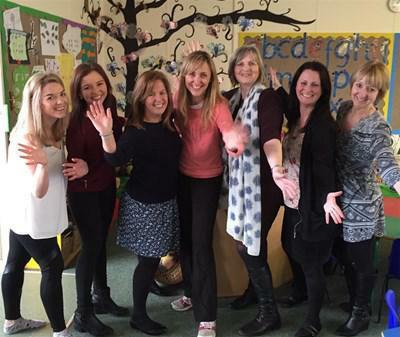 The Staff from Parkgate Primary have accepted the challenge from Claire House, to put on their dancing shoes and learn the group dance for 'Claire House Does Strictly.' The event will be taking place on 26th March 2016 at The Titanic Hotel, Liverpool. When the school adopted Claire House as their charity for the children to raise money, the staff thought it only right they set their own challenge. Believe me after the first rehearsal they've found it very challenging! Libby Smith, Helen Hayward, Jacqui Lloyd, Pam Hankinson, Diane Davies, Sally Shipley and Catherine Mckeown can be seen around school practising their moves at every opportunity! Watch this space for further photos and maybe even videos! and remember to donate generously! !